The Japanese tea house at the Marimekko section of the Finnish Design Exhibition. Dual exhibitions: "Power of ceramics: Modernism in finnish Applied arts", and "marimekko spirit: Finish design exhibition". For information on ​directions and exhibition schedule, see our news page. Next year, 2019, marks the 100 year anniversary of the establishment of diplomatic relations between Finland and Japan.The Nordic country is already busy reaching out to the Japanese audience in the world of arts and design. An exhibition of Finnish ceramic art and textiles is now underway in the Museum of Modern Ceramic Art in Tajimi. The ceramic exhibition is the first ever to offer a comprehensive display of Finnish ceramic art works, including renowned works from the 1950's and 60's. Marimekko is a Finnish textile manufacturer founded in 1951. The ethos of the company has always been free creation. The result is designs that are often inspired by nature, with crisp colours - creations that often connect wonderfully to Japanese design ideals. Among the giants of Finnish ceramic artists on display is Birger Kaipainen, famous among other things for his ceramic birds. These and other works of by the renowned artist goes beyond what many in Japan think of as ceramics, as they incorporate a variety of materials and objects other than clay. On the design side of things, Kaipanen is also well known in Japan for his beautiful patterns on tableware. Porcelain "Paratiisi", 1969, by Birger Kaipainen. While Kaipanen is certainly a name in the ceramic Hall of Fame, it should be noted that the majority of artists featured in this exhibition are female. While their works can't be featured here due to copyright reasons, we strongly encourage you to go to the Ceramic Park in Tajimi to explore their imagination. 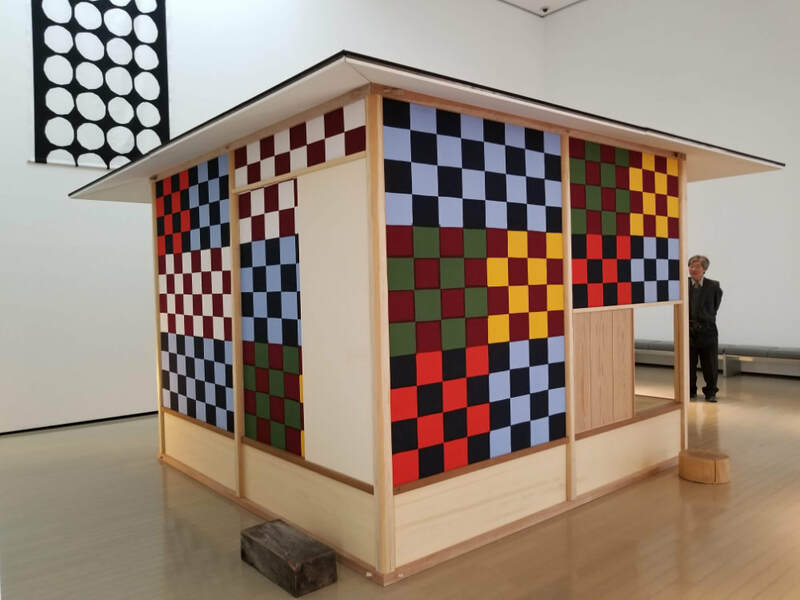 A large number of works are beautifully displayed in the museum, and next doors you will find the Marimekko exhibition, which is equally intriguing. ​This exhibition introduces works by famous designers who were asked to create something inspired by the word "JAPAN". They have even created a tea house based on the Japanese tea ceremony ideals but influenced by modern Finnish design thinking. The visitors of the Marimekko exhibition are met by a colourful display of designs by three outstanding designers. 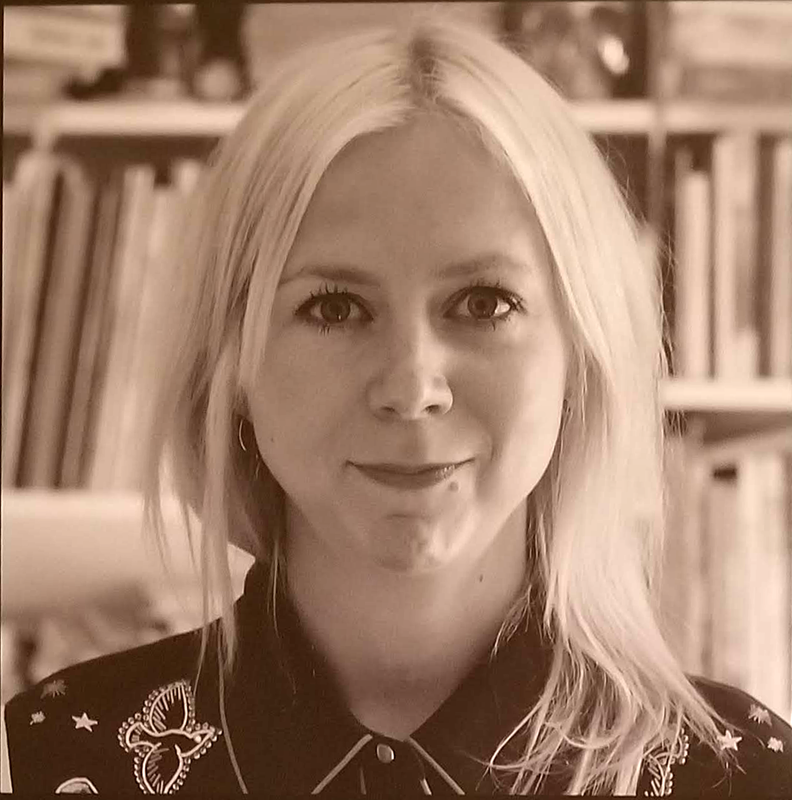 Illustrator and designer who has been collaborating with Marimekko since 2006. Her designs are "bold but subtle at the same time, using diverse selection of techniques including water colour, markers and gouache." 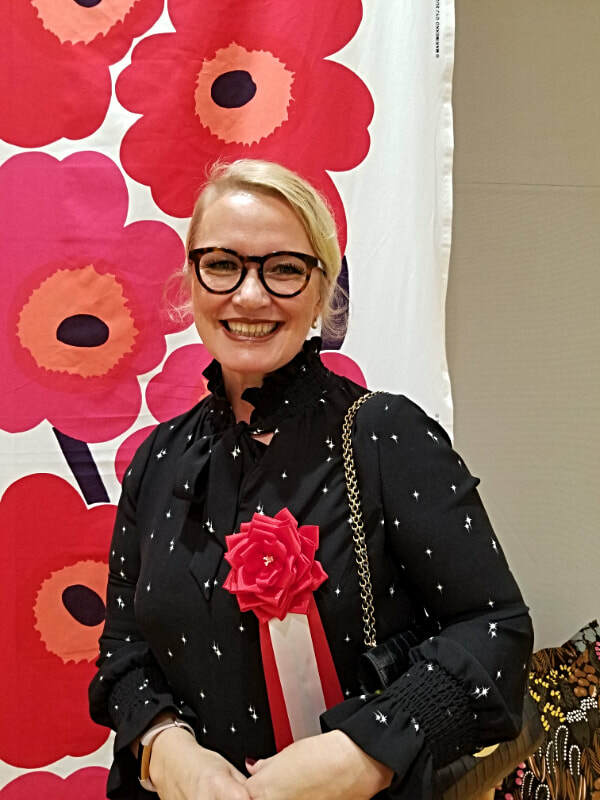 Print and graphic designer who has been designing for Marimekko since 2003. Her designs are "characteristic for their graphic and joyful image." Contemporary artist and freelance print designer. 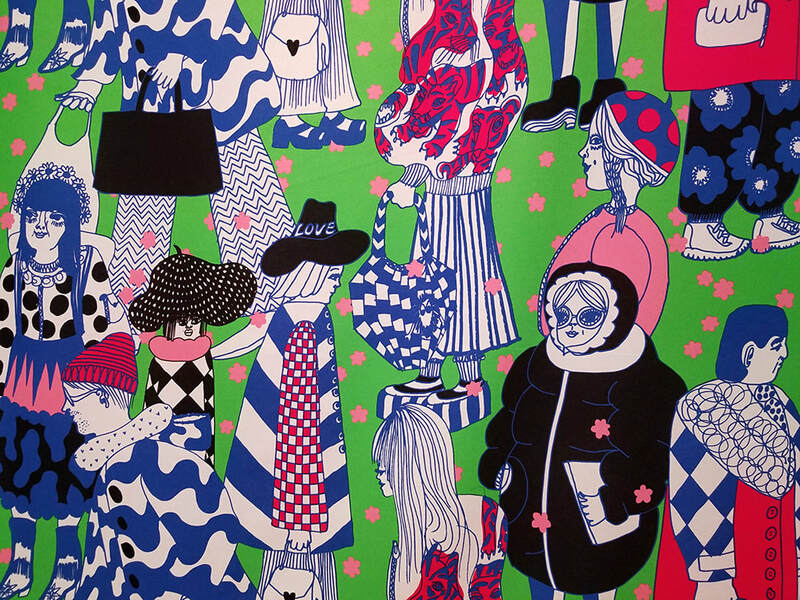 Paavo started to design prints for Marimekko in 2011. "Paavo has the talent to interpret his inspiration of nature into organic abstract patterns." Close-up of a textile pattern created by Aino-Maija Metsola. The artist has never visited Japan, but this is how she imagines youth in Shibuya, Tokyo. Note the cherry blossoms falling across the image. Anna-Maria Wiljanen, Director of the Finnish Institute in Tokyo, opened the exhibition. ​Anna-Maria Wiljanen is director for the Finnish Institute in Japan. 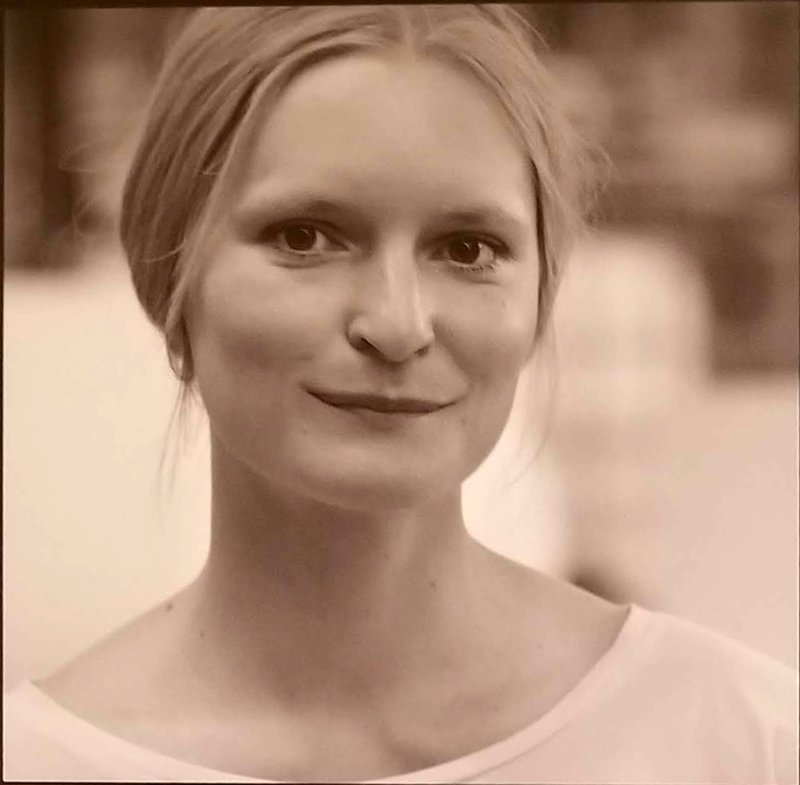 She earned her PhD in art history 2015, with a thesis on European artist communities in the later part of the 19th century and the social interaction between those networks. She is also a polyglot, now learning her eight language - Japanese. I managed to catch her for a moment after her speech at the opening ceremony. 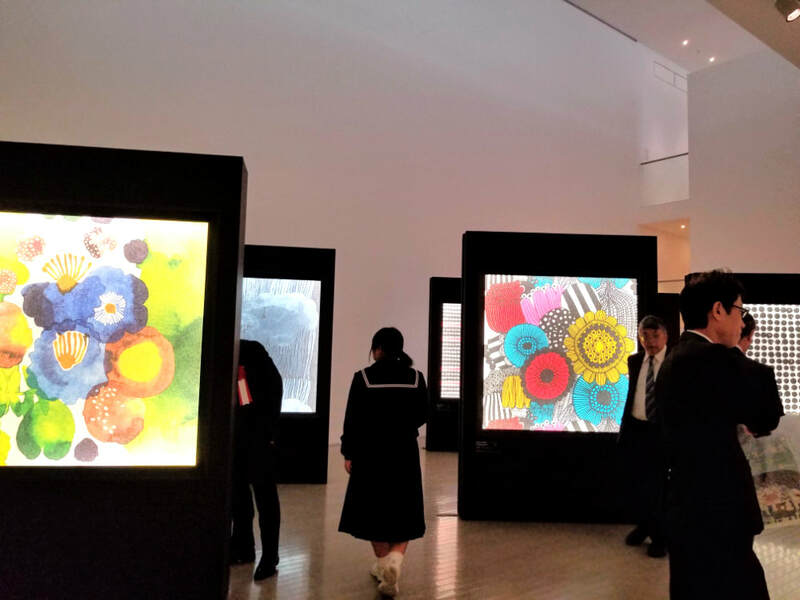 I was curious to learn more about how Finland works to connect to the Japanese through the world of art. Being a Swede, I know we have much to learn from our neighbors across the Baltic Sea when it comes to building relationships with Japan. Santa Clause, for a start, is a Finn in the eyes of many Japanese, after years of intensive marketing. Mumin is phenomenally popular here, and the Finns can pride themselves of a direct air connection with Japan, while a trip to Sweden requires a stop in Helsinki or Copenhagen. While all these accomplishments are business related, I suspected that the Finns were equally successful in the art world. "The Finnish Institute is active in three fields: science, culture and higher education," Anna-Maria explains. "This year is the 20th anniversary of the establishment of the Institute in Japan. Next year is the 100 year anniversary of the establishment of diplomatic relations between Finland and Japan. After that Tokyo will host the Summer Olympics in 2020, so I am truly busy working with celebrations." Do you see any exciting synergies happening between Finland and Japan in the art and design world, and in particular regarding ceramics? "Absolutely! While Japan and Finland are very different cultures, there are still many similarities between them. One interesting similarity between the Japanese and the Finns is that many of us dislike small talk. For example, in both cultures there can be long pauses of silence in a meeting and the participants are quite comfortable with this. With regards to art and ceramics, minimalism is a very important aspect of both Japanese and Finnish artistic expression. Both Finns and Japanese prefer "less is more". Can you notice that Japanese visitors to the exhibition respond positively to works because if these similarities? 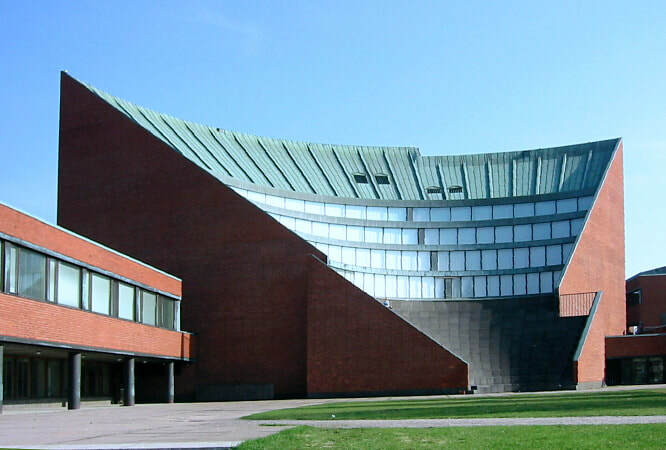 Helsinki University of Technology, the Auditorium. Alvar Aalto. "I do, and I am very keen to pursue this more vigorously. For instance, we have just had an Alvar Aalto exhibition titled “Second Nature” in Hayama. Later there was a lecture in Shinjuku in Tokyo by a Japanese Professor, who talked about Aalto’s windows for two hours! This exchange back and forth is incredibly important in my view. An outside observer can find different perspectives of our art - perspectives that we simply can’t see because we take our own view for granted. Those windows are a great example. This is a fantastic opportunity for new insights! One channel for this is the exchange of artists between Finland and Japan. Artists are invited to stay in the other country and in this way communicate across borders in contemporary art." "A dream of mine is to arrange conferences on the theme of comparative art history. We would discuss the situation during the 1900s here in Japan and compare to Europe. 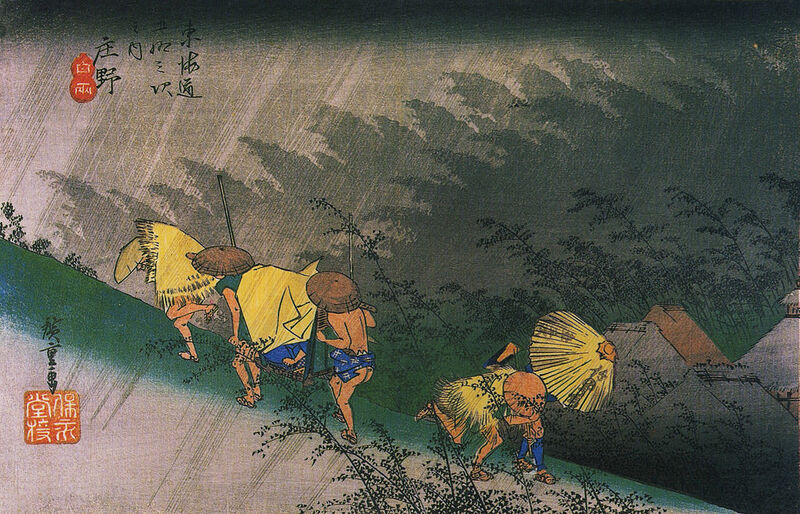 We realised, for example, that there would be much to learn from such a conversation when we arranged a Hiroshige Hokusai exhibition in Helsinki, which was a great success. It made us aware of the similarities between Hokusai’s wood prints and landscape paintings in Finland in the late 1900s. These kind of comparative studies would be truly rewarding, both from the perspective of contemporary art and an art historian’s perspective." 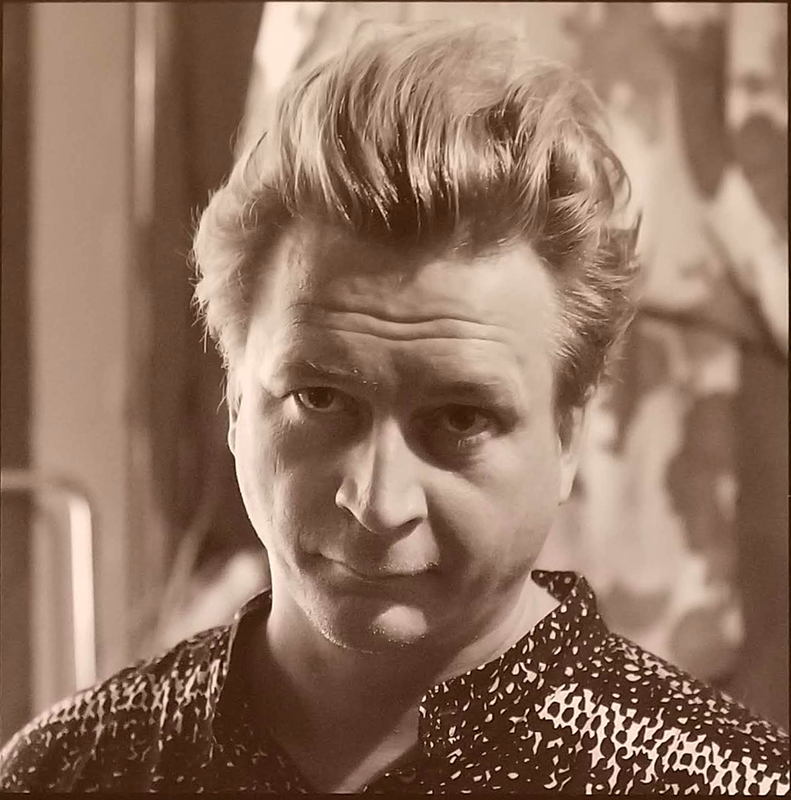 ​Can you give any examples of interesting influences between artists in the two countries? ​"Certainly. We have for example Albert Edelfeldt and Helene Schjerfbeck, who were both influenced by Japan. 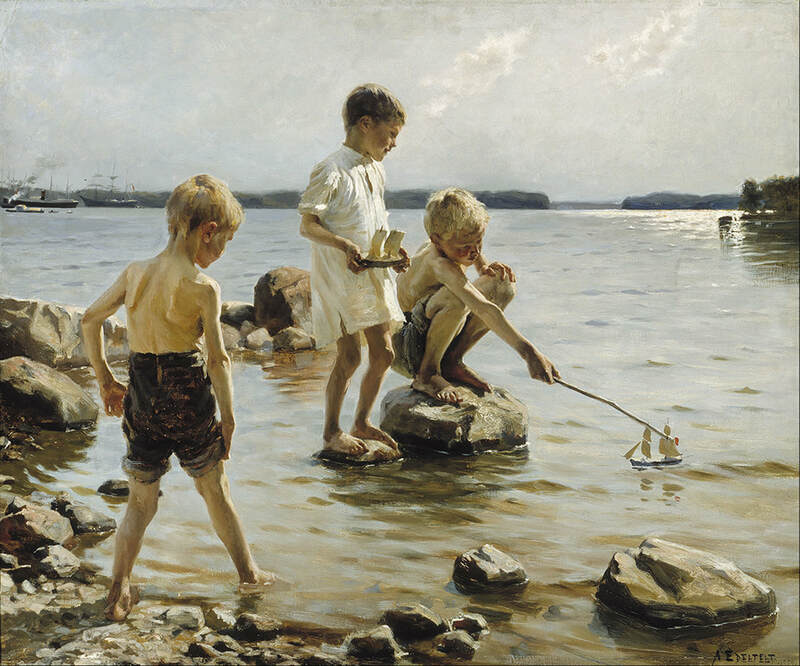 "Boys Playing on the Shore" by Albert Edelfeldt. There are also many examples in the world of landscape painting. Or take Alvar Aalto, who never visited Japan but is clearly influenced by this country. Regarding Finnish influences in Japanese art and design the trend may have been weaker, but I am new here and still have much to learn about the subject." "The Family Heirloom". 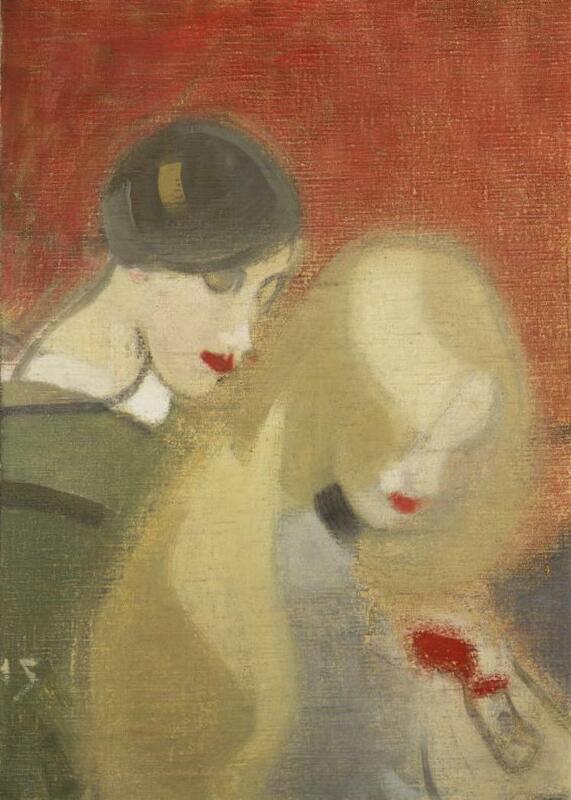 Oil on canvas, 1916, Helene Schjerfbeck. ​In her opening speech Anna-Maria stressed how Finnish ceramics developed from the sense of being Finnish, but also by making a contribution to the world. Finland is a relatively young country, after having been a part of the Kingdom of Sweden from 13th century until 1809, when it became an autonomous duchy of the Russian Empire until 1917. It was only then the country could declare independence. Perhaps this new won freedom contribruted to the outburst of creativity we see in Finnish art after that time. 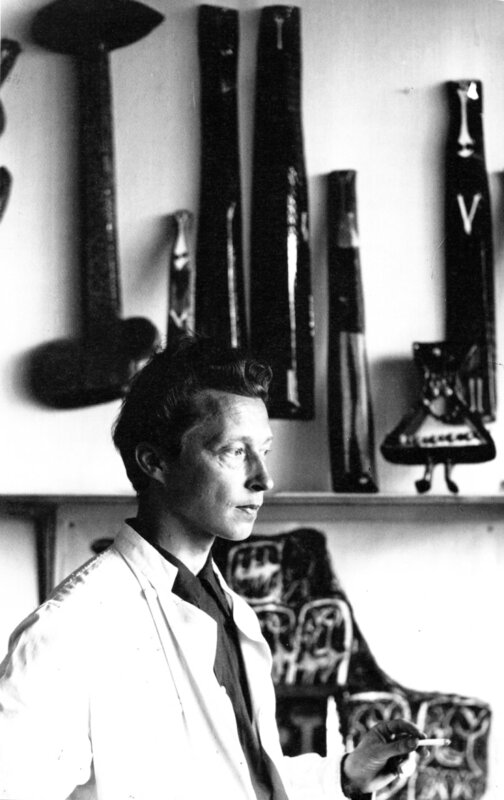 As examples she mentions the ceramic birds of Birger Kaipainen, and “the classically pure and splendidly glazed ceramics of Elsa Elenius." The starting point of Elsa Elenius's own production was old Oriental ceramics, which she greatly admired. The Finns are now working to build their brand in in Japan by expanding from design to art. Art is a strong theme in the ceramic exhibition, and it is a first to accentuate the art of Finnish ceramics in such a pronounced way in Japan, according to Anna-Maria. “So far Finnish exhibitions in Japan have focused on product design, but this exhibition has a different angle", she says. "This exhibition gives an excellent opportunity to get a closer look at the ceramics from the 1950s and 1960s, an era also known as the Golden Age of Finnish design. The exhibition also challenges the viewer to reflect on the visions of fine art and craft. There are more than one hundred artworks. A majority of the artists are female, which is notable." How do you view the future of Finnish art and design, in particular in ceramics? "I see a bright future for Finnish art and design and ceramics in particular. Much of this has to do with the mecenate Kyösti Kakkonen who has tirelessly collected an amazing collection that can be seen in Tajimi. [Editor's note: Kyösti Kakkonen (born December 7, 1956 in Kiihtelysvaara) is a Finnish businessman, art collector and millionaire. He is the chief executive officer of Tokmanni]. He has teamed up with Dr Harri Kalha. [Editor's note: Kalha is a Docent of Art History, Docent of Women's Studies at the University of Helsinki]. The exhibitions and brilliant publications have worked for the relaunch of power of ceramics. I mean that the Finnish ceramics, the colors, themes and the brilliant artists are now seen in a different, more vivid light – attracting younger collectors! There are also new design companies that are focusing on ceramics for example Vaja Finland! 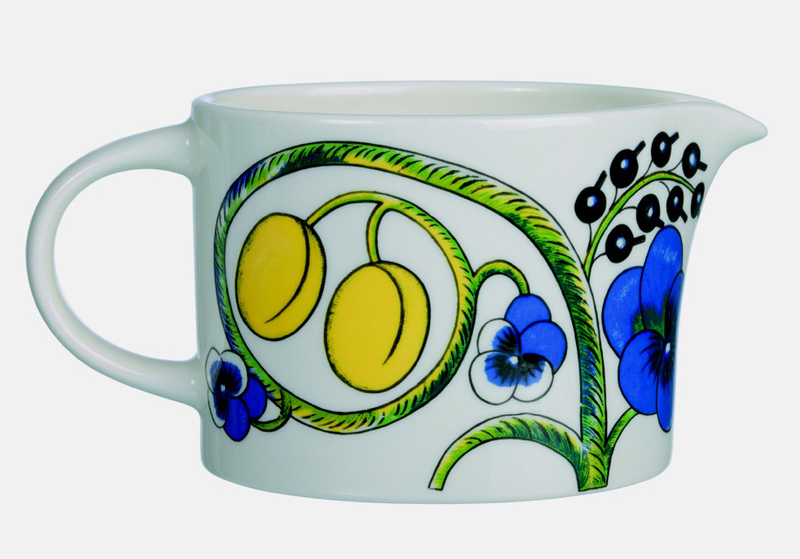 The idea is to continue the great tradition of Finnish ceramics!" Note that this video is subtitled in Swedish, Japanese and English. Turn on subtitles using the cc icon at the lower right corner of the screen (PC) or the three dots (Mobile) in the same location. Not only did the Finnish exhibition in Tajimi open Japanese eyes to the beauty of artistic expression in the Nordic country. Tajimi also got a chance to express itself to Anna-Maria when she visited the Eiho-ji Zen temple after the opening ceremony. She found it to be impressive, even in comparison to the temples of Kyoto. "It's so beautiful that it hurts! ", she exclaimed. Indeed, it is a wondrous experience to have a massive Zen temple garden virtually to yourself a quite evening like that. When we left the garden a mighty bell rang out from the temple, its deep voice vibrating in the dusk at slow, steady intervals. Perhaps it is this way a sense of wonder and awe can travel across borders in the world of art as well. Not by words, but by vibrations.